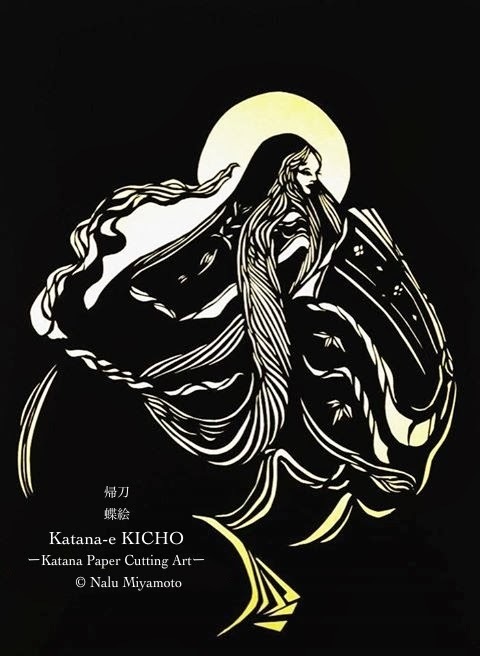 We continue with the Katana Papercutting Art of Nalu Miyamoto. Nalu shares with us – Moon Princess Kaguya – the second of her series on Japanese princesses (some real and some mythical). One day an old man Haketori-no-okina found a mysterious, shining stalk of bamboo. After cutting it open, he found inside it an infant the size of his thumb. He rejoiced to find such a beautiful girl and took her home. He and his wife raised her as their own child and named her Princess Kaguya. Princess Kaguya grew more beautiful and received marriage proposals from the Emperor and five young noblemen. However, one night when the moon was full, beautiful moon people appeared in the sky and Princess Kuguya returned to the moon. This entry was posted on February 18, 2014 by Paulina Constancia in Uncategorized.